An Arab military coalition invaded Yemen’s main Red Sea port on Wednesday, worsening what is already the world’s most severe humanitarian disaster by disrupting the delivery of food and other supplies to millions of Yemenis. The air and ground attack by forces loyal to Saudi Arabia and the United Arab Emirates was aimed at tipping the balance in Yemen’s long-running civil war and driving Iranian-backed rebels out of the port of Al Hudaydah. Although fighting appeared to be limited to the outskirts of the city on Wednesday, the prospect of sustained fighting there stands to produce one of the bloodiest urban battles of the war, deepening what is already a catastrophic humanitarian situation. After years of war, eight million of Yemen’s estimated 28 million people are at risk of starvation, according to the United Nations and aid agencies. A protracted battle for Al Hudaydah could rival the fighting that ravaged Aleppo, Syria, or Mosul, Iraq, cities that have come to symbolize the brutality of warfare in the Middle East, according to humanitarian workers and diplomats. About a quarter of a million people in Al Hudaydah, a city of 600,000, are in danger of injury or death in an urban assault, the United Nations said. The United Nations and the International Committee for the Red Cross withdrew most of their staff members from the city over the past few days. But a battle there will have consequences far beyond the city, whose port is the main entry point for aid to the rest of the country. The Saudi-led coalition attacked the southern edge of Al Hudaydah by land and air on Wednesday. The Emiratis have signaled that they are planning a separate naval offensive to take the port. The Houthi rebels, an armed movement with ties to Iran, said they had foiled a sea landing near the port. “The Saudi coalition has not advanced at all in Hudaydah,” Dayfallah al-Shami, a Houthi official, told Mayadeen television, a satellite channel based in Beirut, Lebanon. The war between the Saudi-Emirati coalition and the Houthis is just one facet of the unrest that has splintered the impoverished country. In the south, Emirati-backed local forces, assisted by American drones, are battling the Yemeni branch of Al Qaeda. A southern insurgency wants to secede from the north. And the country’s internationally recognized president, Abdu Rabbu Mansour Hadi, has no natural constituency in the country and instead lives in exile in Saudi Arabia. The Saudis and Emiratis intervened in the war three years ago with hopes of a quick victory over the Houthis, whom they see an Iranian proxy. Instead, the two nations have been stuck in a quagmire. Crown Prince Mohammed bin Salman of Saudi Arabia has been sharply criticized for the decision to carry out an air war in Yemen, keeping Saudi casualties low but killing thousands of Yemeni civilians. The airstrikes have crippled the country’s infrastructure and created the conditions for one of the world’s worst cholera epidemics in 50 years. The stalemate with the Houthis, and the lack of a clear strategy or exit plan, have raised questions about whether Prince Mohammed and his ally, Crown Prince Mohammed bin Zayed of the Emirates, have locked their nations in a costly and unwinnable conflict. The assault on Al Hudaydah appears to be their effort to break the logjam and gain an upper hand in peace negotiations. “The liberation of the city and port will create a new reality and bring the Houthis to the negotiations,” the Emirates’ state minister for foreign affairs, Anwar Gargash, said on Twitter on Wednesday. The Saudi coalition said the invasion was intended to be limited and swift. A military spokesman, Col. Turki al-Maliki, said the plan was to take control of the airport, seaport and the route leading to the capital, Sana. “We will not fight a street war with the Houthis in Hudaydah for the safety of civilians,” he told the Saudi-owned Al Hadath TV. But experts say that even a victory in Al Hudaydah is unlikely to significantly alter the underlying dynamic in Yemen. The Houthis still control the capital, Sana, as well as territory in northern Yemen, their ancestral lands. The United States has backed the Saudi-led coalition, but American military officials, including Defense Secretary Jim Mattis, have warned their Arab allies that the assault could end in failure both militarily and politically, and result in further civilian suffering. More and more Republican and Democratic lawmakers in Congress are criticizing the American role, accusing the Pentagon of being complicit in the bombing campaign. Nine Senate Republicans and Democrats wrote to Mr. Mattis and Secretary of State Mike Pompeo on Tuesday, expressing “grave alarm” that the offensive would worsen the humanitarian crisis in the country. In the past few days, it appeared that American officials were resigned to the offensive going forward, and they began focusing on ensuring that an assault did worsen conditions on the ground. 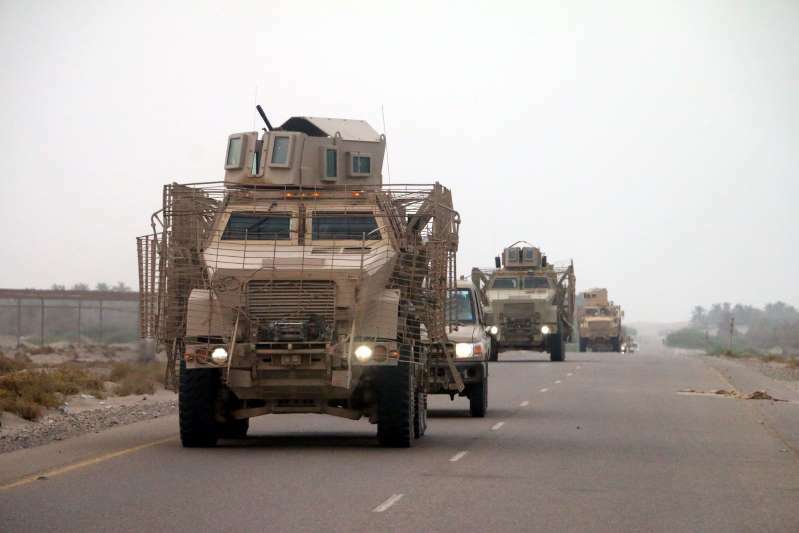 Yemeni troops, trained and financed by the United Arab Emirates, led the ground offensive on Wednesday, beginning around daybreak on the southern edge of the city. There were also airstrikes on two pro-Houthi neighborhoods in the same area, according to residents. The Emirati-backed troops broke through defensive perimeters on the southern outskirts of town, according to the state news agency WAM, and some pushed as far as the perimeter of the airport. The reports could not be independently confirmed. A commander of one of the Emirati-backed infantry units, Abu Zara’a al-Muharami, said that they were awaiting orders to move toward the airport and then to the seaport, their final objective. Aid workers who have remained in Al Hudaydah said the center of the city remained mostly quiet. The Houthis reinforced their defensive positions, deploying armored personnel and combat vehicles on the city streets, residents said. Mr. Shami, the Houthi official, said his forces had burned 11 military vehicles belonging to the Saudi alliance. The Emirates said Wednesday night that four of their soldiers had been killed. The United Nations, which had been frantically trying to unload two shiploads of food aid before the hostilities broke out, was setting up distribution hubs for emergency relief and food packets in the event of large civilian evacuations from the city. The United Nations Security Council was scheduled to meet on Yemen on Thursday. The Saudis and Emiratis claim that the Houthi rebels have been smuggling arms through the port of Al Hudaydah, including missiles used to attack Saudi Arabia. The operation in Al Hudaydah began while Washington’s attention was still focused on the summit meeting between President Trump and North Korea’s leader, Kim Jong-un. It was not immediately clear what role, if any, American military advisers would play in the campaign. Since 2015, the United States has provided the Saudi-led air campaign in Yemen with air-to-air refueling, intelligence assessments and other military advice. The New York Times reported last month that United States Army commandos were helping to locate and destroy caches of ballistic missiles and launching sites that Houthi rebels were using to attack Saudi cities. The Pentagon insists that all of its military aid is noncombat assistance, such as advising the Saudi Air Force on adopting bombing practices that kill fewer civilians. But at the same time, the defense contractor Raytheon is courting lawmakers and the State Department to allow it to sell 60,000 precision-guided munitions to the Saudis and Emiratis, in deals worth billions of dollars. American advisers do not give direct or indirect approval on target selection or execution of bombings against Houthi rebels, Pentagon officials say. Rather, they give advice on targeting procedures and facilitate checks of a list of “no strike” buildings, like mosques and marketplaces. Yemen’s civil war began in the wake of the 2011 Arab Spring protests that toppled the country’s longtime autocratic president, Ali Abdullah Saleh. Divisions over power sharing gave way to military conflict, and competing forces now hold separate areas of the country. The Houthis, who are from northern Yemen and represent one of the country’s major political constituencies, swept south three years ago and seized control of Sana. Soon after, they stormed Al Hudaydah. Saudi Arabia and the Emirates intervened militarily, funding and training Yemeni forces opposing the Houthis. Most Yemeni analysts and diplomats view the war as a battle of political supremacy, not religion. The Houthis, as well as several other Yemeni factions, belong to a Shiite sect indigenous to their country and different from the one followed by most Iranians. The Saudis and Emiratis say they want to help restore Yemen’s territorial integrity. But whatever happens in Al Hudaydah, it is unlikely to do that.